Two of the five main databases that catalog exoplanet discoveries list 1,010 confirmed alien worlds as of today (Oct. 23). That's a lot of progress since 1992, when researchers found the first-ever exoplanets orbiting a spinning neutron star, or pulsar. "However, 1,000 exoplanets in two decades is still a small fraction of those expected from the billions of stars in our galaxy," he added. "The next big goal is to better understand their properties, while detecting many new ones." Indeed, the current tally is likely just the tip of the exoplanet iceberg. For example, a study published last year estimated that every star in the Milky Way hosts 1.6 planets on average — meaning that our galaxy likely harbors at least 160 billion alien worlds. And those are just the planets with obvious parent stars. Another recent study calculated that "rogue planets" — those that cruise through space apparently unbound to any star — may outnumber "normal" worlds by 50 percent or so. The number of confirmed planets should continue its dramatic upward swing in the near future as astronomers continue to hone their techniques and analyze data collected by instruments on the ground and in space. The most prolific of these instruments is NASA's Kepler spacecraft, whose planet-hunting mission came to an end this past May after four years when the second of its four orientation-maintaining reaction wheels failed. Kepler has flagged nearly 3,600 planet candidates to date. Just 156 of them have been confirmed so far, but mission scientists expect at least 90 percent will end up being the real deal. 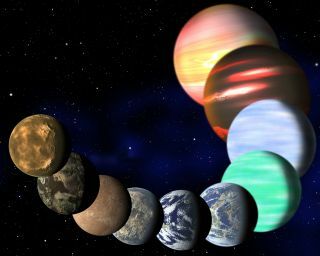 The five main exoplanet-discovery databases, and their current tallies, are: the Extrasolar Planets Encyclopedia (1,010); the Exoplanets Catalog, run by the Planetary Habitability Laboratory (1,010); the NASA Exoplanet Archive (919); the Exoplanet Orbit Database (755); and the Open Exoplanet Catalog (948). The different numbers reported by the databases reflect the uncertainties inherent in exoplanet detection and confirmation.